By today, November 23rd, most does have been bred where I live in southern Missouri – and throughout most of the whitetail’s range. There are exceptions including parts of Alabama, south Texas, etc. How can I say that confidently? Each year throughout the whitetails’ range most fawns are born before June 15th (except in parts of Alabama, south Texas, etc.). The gestation period for white-tailed deer is approximately 200 days. Therefore does bred on or before November 23rd would be born on or before June 11th. Most fawns are born during mid-May to early June. This picture was taken May 25th and the fawn is probably a week or less old. Not many fawns are seen traveling with does at this time of year at my farm. Fawns are usually two to three weeks old when they begin actively following does. It’s certainly possible to see a doe moving a fawn (encouraging it along) before the fawn is two weeks old, but when you begin seeing fawns in multiple places you can be confident they are at least two to three weeks old. 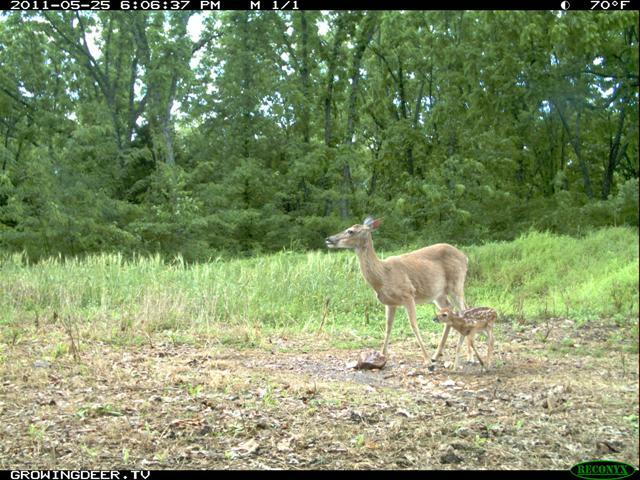 A great tip is to pay attention to when you see fawns or begin noticing fawns on trail cameras and then subtract 190 days and estimate when the peak of breeding occurred (and will occur again) in that area. I’d much rather hunt a week or so before than after the peak of breeding! When the majority of does are receptive, bucks don’t have to move far to find a doe and begin tending her. Bucks will move the least amount possible while tending a doe. More movement simply means another buck is likely to attempt to cut in on the action. I like hunting before the peak of breeding more than the week after the peak of breeding. There are two reasons for this statement. First, there will likely be more bucks available to hunt during the pre-rut. Some bucks will be killed by hunters, injured or killed while fighting, etc., during the peak of breeding. There will simply be fewer bucks available to hunt after the peak of breeding. Second, the level of activity/movement seems higher before the peak of breeding compared to after the peak. The party is just starting and everyone wants in on the action! Paying attention to when you and your friends begin seeing fawns next summer can be a great clue to when you should schedule time to hunt next fall!